In 2016 we were extremely proud to have been asked to help Andy and Lee Relf raise money for Brain Tumour Research. Father and son duo Andy and Lee Relf have entered the 2016 Celtic Crossing event to be held on 24 September, competing in a Fenn XT double surf ski. Their aim is to raise awareness and funding for Brain Tumour Research. Brain tumours kill more children and adults under the age of 40 than any other form of cancer and the family unfortunately have 1st hand experience of this devastating disease. In October 2014, without any prior warning, Andy’s daughter, Lee’s sister, Gemma, then aged 29, was diagnosed with a malignant brain tumour after just a few days of migraine-type symptoms. Her sons, Noah and Dylan were just eight weeks and two years old at the time. The crossing would be challenging for any experienced paddler, but this is an epic undertaking for Andy and Lee as they are complete self-taught amateurs! They came up with the idea of entering the challenge in May last year, as a way of raising awareness and funding for Brain Tumour Research, a charity very close to their hearts. Glenn Eldridge our event organiser and paddle guru has been working with them over the past 12 months giving them some advice on training and general preparation – and more importantly the enthusiasm needed to give them the belief that it was achievable. Preparation has been ongoing for over a year, with a steady approach to building up their general fitness levels as well as on the water training in the Blackwater estuary in North Essex, using plastic sit-on top kayaks – yes , you’ve read that correctly, plastic sit-on top kayaks! At the end of June this year they took delivery of their Fenn XT double surf ski and have been practicing most weekends since. Andy said the switch of craft was probably comparable to jumping straight from a childs tricycle to a racing bike and entering the Tour de France 10 weeks later – it’s been a steep learning curve! Over the last week they have had some invaluable on the water coaching and advice from 4 very experienced paddlers, Mark, Richard, Gavin and Willem, a 2015 Celtic Crossing Veteran, who paddle from Southend in Essex. This is the 3rd year the Celtic crossing has been run and the event organisers are looking forward to another epic event. You can follow all the latest news by following the Celtic Crossing on Facebook and right here on this website. Being diagnosed with a brain tumour was all very sudden. I had always been a fit and healthy person. I did suffer with some headaches during my second pregnancy, but my midwife reassured me it was down to hormones. Less than a couple of months after my second son was born I woke up with an awful headache and felt sick. I slept all day and woke in the early hours with a pain I can’t describe. I waited for my husband who is a police officer to return from his shift and then went to the accident and emergency department at our local hospital. A CT scan found a six-centimetre lump on my right frontal lobe. Within hours the neuro consultant came round and said they’d have to open up my head and have a look. That’s when I phoned my mum and husband Rob to tell them I wasn’t coming home but instead going to be transferred to Queens Hospital for emergency surgery. Three weeks after the craniotomy, the prognosis came through. The cancer was terminal. I had a grade IV glioblastoma multiforme– the most aggressive type of tumour, with no known cure. The tumour caused me to have seizures, so I take anti-epilepsy medicine and I have six-monthly scans to monitor the regrowth. Because I’m generally healthy, I’m told I’ll be a ‘long-term survivor’ of this. I’m doing really well and I think I’m surprising everybody. I have to hope that, one day, a cure will be found – but because I’m getting on with my life, I tend to forget about it. If that wasn’t enough to contend with, earlier this year, Gemma’s son Noah who was by then 16 months old also became ill and was also diagnosed with a tumour. 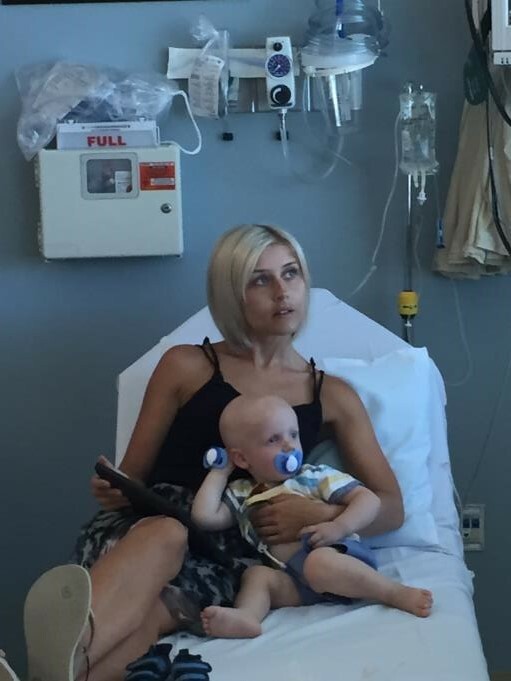 Noah was diagnosed with a retinoblastoma, a rare malignant tumour of the eye. Having just reached his 2nd birthday in August, he has already undergone surgery to have his eye removed. In addition, he has just completed 6 months of treatment of both chemotherapy and proton beam therapy carried out in the UK and USA in the hope of killing any remaining cancerous cells. Noah is coping really well with life with 1 eye and like his mum is having regular scans to monitor the situation. In addition to brain tumour research, family and friends have been involved in a number of other sponsored and fund raising events in aid of the Childhood Eye Cancer Trust (CHECT) and other charities that have supported them.